Romans 5:3-4, NLT, We can rejoice, too, when we run into problems and trials, for we know that they help us develop endurance. 4 And endurance develops strength of character, and character strengthens our confident hope of salvation. We must be people who are relentless—always abounding in the work of the Lord. As we overcome our trails it builds our confidence in our salvation, when the inner work of God begins to manifest itself in the outward parts of our lives, we are on the right track, we cannot give up to easily, because great is our reward. Relentless is a word used to describe people who will not take no for an answer! They try things one way, and if that doesn’t work, they try it another way. But they don’t give up. If you are about to break beneath the stress of intense struggle, be relentless! Do not quit! The problem isn’t failure; the question we must ask ourselves… Was it our lack of commitment that allowed us to forfeit an opportunity to turn the test into a triumph? 2 Corinthians 12:9, And He said to me, “My grace is sufficient for you, for My strength is made perfect in weakness.” Therefore most gladly I will rather boast in my infirmities, that the power of Christ may rest upon me. A terrible thing happens to people who give up too easily. It is called regret. It is the nagging, gnawing feeling that says, “If I had tried harder, I could have succeeded.” It is a terrible thing to lie down at night thinking, “I wonder what would have happened if I had tried this or that?” We can never be sure of the answer unless we rally our talents, muster our courage, and focus our strength to achieve a goal. Granted, we all experience some degree of failure. That is how we learn and grow. If a baby had to learn how to walk without falling, he would never learn. A baby learns as much from falling on his bottom as he does from his first wobbly steps. The Church must open its doors and allow people who have a past to enter in. We as a congregation must be willing to embrace them, regardless of their past. Remember, the same blood that cleanses one man can restore another. There is weakness in all of us, it is the grace of God that empowers us to live strong and relentless. The Bible never camouflaged the weaknesses of the people God used. God used David. God used Abraham. And here today, the weak are among us, we’ve got wounded people, we’ve got hurting people. Sometimes, they catch fire and relentlessly move forward and sometimes, they stumble backwards and get out of control. So, we have to readmit them into the hospital and allow them to be treated again. That’s what the Church is designed to do. The Church is a hospital for wounded souls. 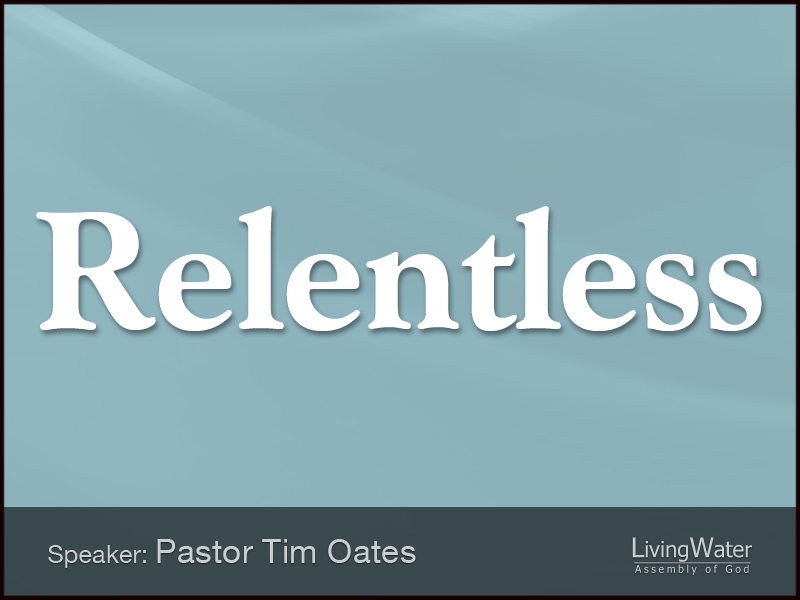 I have passion to be relentless, for God and His children.